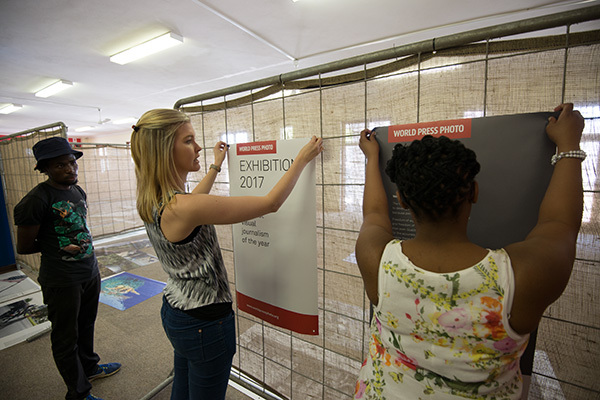 Curators Femke van der Valk (left) of World Press Photo and Charmaine Naidoo (right) contracted to Africa Media Online start the process of hanging the World Press Photo Exhibition 2017 in the Raymond Slater Library at Hilton College ahead of the Hilton Arts Festival 2017. Africa Media Online partnered with World Press Photo to bring the Exhibition to KwaZulu-Natal province in South Africa for the first time in almost 20 years. Ladies and Gentlemen, thank you for taking time out of your busy schedules to attend this event. I particularly want to thank Mr George Harris, Headmaster of Hilton College for coming to officially open this exhibition considering that on this evening he has been asked to be at two other events at the same time. 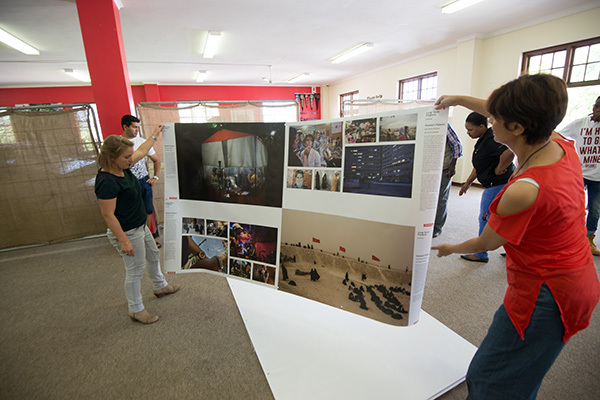 I also want to thank Femke van der Valk from World Press Photo for being here, guiding us in putting up the exhibition and being part of this launch. At the start of this evening I would like to say a few words about the importance of this event and the significance of having this Exhibition here at this time in the history of our nation. Few would argue that a free press is not fundamental for democracy. An empowered population is an informed population. And one of the quickest ways to make a society servile is to starve them of access to an accurate record of what is going on around them – to the “truth” as we like to say. Africa Media Online staff members Solomon Chinga, Angela McEwen and Karabelo Lenong hanging the World Press Photo Exhibition in the Raymond Slater Library at Hilton College ahead of the Hilton Arts Festival 2017. Africa Media Online partnered with World Press Photo to bring the Exhibition to KwaZulu-Natal province in South Africa for the first time in almost 20 years. South Africa has seen some erosion of these freedoms in recent times. Certainly the press feel under pressure in our country as in many parts of the World. Recently, however, at Africa Media Online we have experienced an erosion of these freedoms not at the hands of the State, but at the hands of personal and commercial interests. Africa Media Online runs a picture library. Some of our biggest clients are textbook publishers. In the past few years, however, we were told by these clients that they want model releases for all people in the pictures that we supply to them. These publishers have been coming under pressure from lawyers representing people who have found themselves in pictures used in the textbooks and who now want financial reward for the use of their image. When the textbook publishers ask us to supply model-released pictures, they are not speaking about pictures of people taken in private homes or at private functions (the kind of pictures that the paparazzi take), they are speaking of the kind of editorial pictures generated by editorial photographers mostly in public spaces – real people on a real beach or a real street or a real factory worker in a real factory. They don’t want the real worker any more, they want a model pretending to be a factory worker or they want the real factory worker to sign a document that says that his image can be exploited for any use in any media ad infinitum. What they are doing is swapping a recording of reality for an acting-out of “reality”. Swapping a photograph for an illustration. Swapping a relationship based on trust between the photographer engaging with the subject, for a commercial transaction – turning an editorial photographer into a commercial photographer. 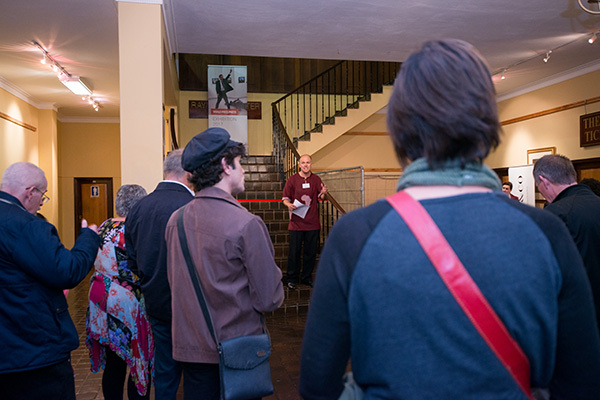 Me (David Larsen) addressing the guests at the opening of the World Press Photo Exhibition 2017. Africa Media Online partnered with World Press Photo to bring the Exhibition to KwaZulu-Natal province in South Africa for the first time in almost 20 years. What this does to textbooks, of course, is to remove them one step further away from reflecting reality or reflecting “truth.” You are no longer dealing with primary sources. You are dealing with reflections of primary sources or reenactment of primary sources. While this certainly has impact of the reliability of textbooks, what this does to the ethics of journalism, is perhaps even more serious. We deal with editorial photographers – photojournalists and documentary photographers. They maintain the strict ethics of journalism – of being a witness to reality. Of being there in as unobtrusive a manner as possible to witness and to carry the record of witnessing the actual event back to the public so that all can see and be informed and make decisions based on the “facts”. In terms of that ethic paying models to reenact a scene is anathema to editorial photographers and an undermining of the ethic of being an unobtrusive witness. Not so commercial photographers whose job is to enable products to be sold or appetites to be created or heightened. You might say that editorial photographers are in the pursuit of truth and commercial photographers are in the pursuit of propaganda. In a world of “fake news” and “alternative facts” that is a very important distinction to make. But it is not a very easy distinction to make nowadays post Jacques Derrida and Michel Foucault and the other deconstructionists. Postmodern philosophy has left us asking, like Pilate did of Jesus “What is truth?” Is there such a thing as truth? And if there is, is it accessible to us? Is it knowable by us? 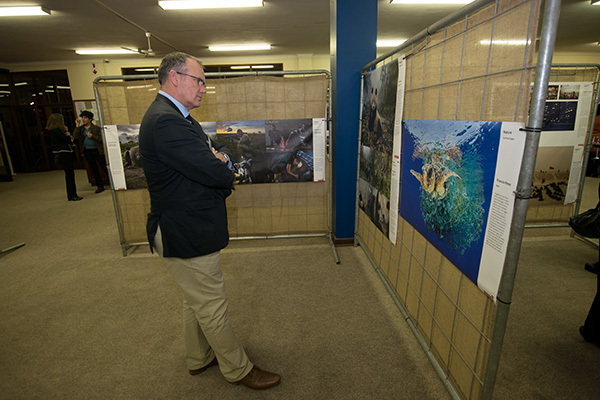 Mr Jonathan Manley, headmaster of St Mary’s DSG in Kloof views the World Press Photo Exhibition 2017 during the launch event ahead of the Hilton Arts Festival. Africa Media Online partnered with World Press Photo to bring the Exhibition to KwaZulu-Natal province in South Africa for the first time in almost 20 years. Being mindful of that, the question that still needs to be asked is, when does an “angle” cross over into being propaganda – no longer reflecting reality but doing violence by manufacturing opinion or consent? When does exegesis become eisegesis? When does allowing the subject to speak for him- or herself stray into putting words in the subject’s mouth? When does reflecting events taking place before one’s camera cross the line into actively (rather than inadvertently) influencing events before one’s camera? I would suggest that as the press we stray into this area far more often than we care to admit. These are important questions to ask ourselves. Yet in spite of that at the end of the day we can say that we are witnesses to something, and that that something is not just inside our own eyelids. Reality does exist as an objective actuality outside our own minds, however subjectively we may perceive it. 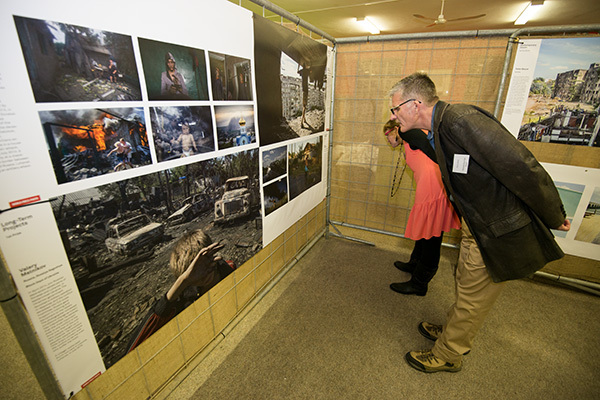 Guests engage with the World Press Photo Exhibition 2017 at the launch event ahead of the opening of the Hilton Arts Festival 2017. Africa Media Online partnered with World Press Photo to bring the Exhibition to KwaZulu-Natal province in South Africa for the first time in almost 20 years. And so the concept of truth and the pursuit of truth is not something we can dispense with lightly. If we do, we very quickly hand ourselves over to the propagandists – the wealthy and the powerful who can manufacture consent and manufacture taste and manufacture desire and manufacture our patterns of consumption. And just as they do in the commercial space they can do in the public sphere – in politics and in society – influencing what we believe about one another and about groups that are different from our own social group. Which brings me back to the request by textbook publishers. What they should be doing is fighting, fighting to reflect primary sources about the World around us, and fighting to support those who are faithful witnesses to that reality. This is why I love World Press Photo and why I believe it is timely that we bring this exhibition to South Africa regularly. Because if we are in a situation where even the publishers of books, and textbooks at that, are no longer fighting to present independent witnesses to their audience, then what hope do we have that the person on the street understands the value of such work. So many of our photojournalists have given up, they no longer work, or they work part time, because the work they do is not valued and because it is not valued it is not paid for. And so we are losing them in droves to other pursuits that may have less consequence for upholding democracy, but at least they can put food on the table. The work of many of our finest photographers can no longer be seen in the press but only in the rarified air of art galleries. It is not the masses that their images challenge and inform, but the few looking for an enduring investment or enhanced status in the eyes of their clients or colleagues! 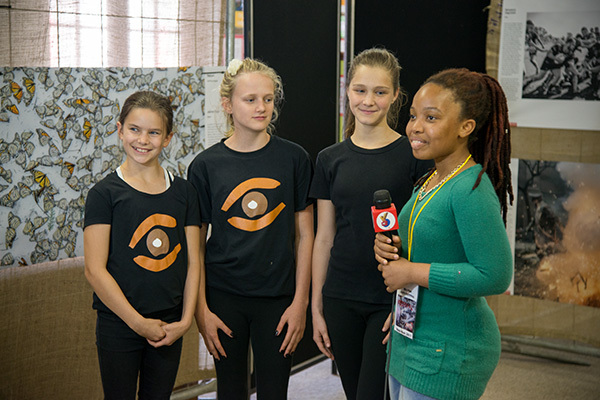 A presenter from Yo-TV interviews young representatives from Africa Media Online on their impressions of the World Press Photo Exhibition 2017. The Exhibition received good coverage from both local and national media. Africa Media Online partnered with World Press Photo to bring the Exhibition to KwaZulu-Natal province in South Africa for the first time in almost 20 years. The World Press Photo Exhibition has great value in not only holding up some of the World’s best images, but also in holding up the ethic of a verifiable and faithful witness to global events, a witness that is critical for all of us if we are to maintain democracy and freedom around the World. So I am so delighted that we have been able to bring this exhibition to the Hilton Arts Festival and to expose the importance of this work to so many young enquiring minds who need to be able to discern, in the deluge of information they are exposed to every day, what constitutes a reliable source! And we are doing that, at the Hilton Arts Festival, not just with the Exhibition, but with DocuFest Africa. Over the next three days we will have 9 of South Africa’s top documentary photographers and curators speaking about long-term project that they have been working on. And it is not just the topics that they are going to be speaking about that is so valuable, but it is the process of getting to the facts and uncovering the truth and of being a faithful witness that is going to be so instructive to us the audience over these next few days. So on behalf of Africa Media Online I want to say, thank you to World Press Photo for partnering with us and thank you to Hilton College and the Hilton Arts Festival for hosting this important event which I hope will be an important event on the KZN calendar in the years to come.